Marilyn SanClemente June 16, 2016 June 16, 2016 All Occasion Card, Birthday, Global Design Team, handmade card, New catalog, Stampin' Up! Today I am sharing a Falling Flowers card that I made for the Global-Design-Project Challenge. This card uses the Falling Flowers stamp set with the coordinating framelits May Flowers. Make sure to order the bundle! 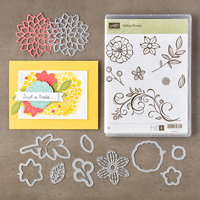 One of the things that I love about this bundle is the detail of the flowers – I am a sucker for floral stamp sets, but also the detail of the matching framelits. The framelits not only match the images in the stamp set, but there are also several other flowers and a leaf with details in the framelits. And there is a beautiful background swirl! Always great for making a background! Card base is Blushing Bride Cardstock with a layer of Very Vanilla Cardstock. The plaid paper on the side is from the Playful Palette Designer Series Paper Stack. I stamped the decorative flourish from the stamp set with Blushing Bride ink on the Very Vanilla cardstock. The leaves are stamped using Pear Pizazz ink on a scrap of Pear Pizazz cardstock and cut out with the May Flowers Framleits. 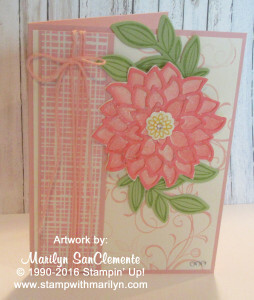 The Dahlia on the card is cut from Flirty Flamingo cardstock and attached to a piece of very vanilla cardstock. I used an aqua painter and Flirty Flamingo ink to paint in the flower. Then I cut around the image – the set doesn’t have a framelit for the outline of the dahlia image… And to add a little zing to the card, I painted the flower with the Wink of Stella marker. Last but not least I wrapped a piece of the Blushing Bride Baker’s Twine around the Designer paper. I hope you have enjoyed this card! Here are the supplies that you need to make this project. Thanks for sharing this gorgeous card in this week’s Global Design Project challenge. I love the pretty colors you’ve chosen and the how you’ve flipped the layout.